As the holiday season is upon us many are looking forward to a much-needed break to end off the year. A fantastic holiday is exactly what is needed to relax, unwind and have a great time. While some people may be looking to gorge themselves on newly found cultural cuisine, others are perhaps looking forward to sipping cocktails on a tropical island feeling the warm sand beneath their feet. When preparing for a trip it is vitally important to ensure that you always have the best luggage for your journey. When travelling I’m always making sure that I pack in all of my “creature comforts” no matter where in the world I am. Being a woman, I like to pack A LOT of things. Even those which seem unnecessary to my partner. In turn, I would need luggage which is offering me the most packing space available. For this reason, I need a Travel bag suitable for all my needs. Since I am very private and like to take care of my things, a durable and sturdy bag must always form part of my travel luggage. I cannot imagine a worse scenario than finding a mangled bag, dented or ripped open with broken zips result in underwear laying all over the place as if they were used as streamers for a massive party. When I find a great travel set of luggage I prefer to stock up on as many pieces as I can. What you want in great travel luggage is Space – no one goes on holidays without doing a little bit of shopping. Extra compartments for much-needed items such as laptops is an all important factor. As I was browsing the web, I came about a few great looking travel suitcase sets. Briggs & Riley have launched three products for the travel connoisseur. I decided to review their line to compare the details regarding their three most sort-after products, and to see if their products really met the standards they seemed to uphold with their customers. 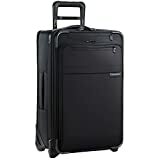 Briggs & Riley Baseline rolling carry-on travel luggage is known as a top pick among travellers. The top pick of frequent travellers for its cx technology. This allows for the bag to expand by up to 25 percent if more packing space if needed. For overhead storage, it compresses back down to its original size. One of the biggest disadvantages is that according to multiple reviews the Briggs & Riley Baseline is actually taller than advertised. The true measurement being 23.5″ tall has made it almost impossible to use this bag as a carry-on, as the U.S airlines have limited their carry-on size to 22x14x9. The Briggs & Riley Baseline can be shipped within U.S (Domestic) but is unfortunately not eligible for shipping internationally. Created using ballistic nylon the outer fabric resists wear and tear, which results in this product lasting a lifetime. Not only that, but the Baseline’s fabric also resists moisture, dirt and abrasion. This is a great feature when it comes to investing in travel luggage which will accompany you on your journey for years to come. Not only that, but the frame is constructed from lightweight hybrid fibreglass which provides flexibility, durability as well as shape retention – so your luggage won’t lose its shape. The Baseline also offers a flat interior surface, great for ensuring that packed clothes are free of wrinkles. More interior capacity is given due to the outside handles as well as an outside pocket. This is great for all those men and women who need the extra space for odds and ends or quick-access items. Stronger V-groove handle tubes ensure less jamming. Tethered smart link straps allow for you to carry multiple bags as one. Another great feature the Briggs & Riley baseline offers are self-repairing zippers with lockable double zipper pulls and gusseted zipper pocket allowing for quick access to items. This collection is described as relaxed – enabling proven functionality for easier and faster getaways. Briggs & Riley Transcend luggage is described as smartly designed while being lightweight. Part of the transcend collection is the Transcend Carry-on Upright bag. 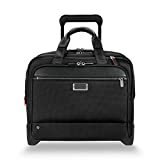 This bag is perfect for when you find yourself in one of those situations, where taking with you only one travel bag seems to be your only option. Unfortunately as with the Biggs & Riley Baseline it yet again seems as if the length of the Transcend is also not what is advertised –posing more problems for customers at airlines. What I find great about the Briggs & Riley Transcend is that when one bag is your only option their upright bag really steps up to the challenge. 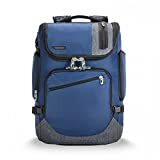 This bag is able to accommodate luggage for a trip with the duration of 2-4 days, while boasting features that’s will aid you in your packings such as a hideaway Cargo net – for items such as jackets and magazines- Adjustable EX Hook Mesh Garment Panels – which are perfect for keeping your clothes from moving, allowing for less wrinkles. Messes and spills are easily cleaned with a damp, wet cloth for convenience. Created for modern professionals who blend work with play. Verb keeps ever-connected forward thinkers at their best and mobile technology at the ready. Fuse business and pleasure with the Pilot Carry-On. This ‘suitcase meets laptop bag’ is the perfect fit for tech-savvy professionals on the go. There seems to be a complaint regarding the treading pulling lose on a certain number of these bags – although thankfully not all. Another disadvantage is the overloaded look the office pocket tends to have when packed to full capacity and zipped up. Another factor is that without clothing being packed in the bag sometimes tends to fall over- even with the laptop in. For this reason, rather pack clothing in and pack your laptop in last to prevent this. The Briggs & Riley Verb Pilot has been praised by many alike for its fantastic added space. You can comfortably pack clothes for a trip lasting up to 10 days. With added storage, it is one of the most practical bags one can own. What is even more amazing is the fact that these bags come with built in RFID blocking pocket for credit cards and passports – which hinders unauthorized access to your personal data. For smaller items, packing provisions have now also been made through CordControl eclectic loops. These loops can hold small items such as earphones cords, memory cards and pens. Also, a fantastic feature known as CordPass organizes and protects power brick and connects power cord to the laptop compartment. This means that your laptop will stay safe and secure while it is being charged. For high-tech gadgets (smartphones, mp3 players, power adapters etc.) Compartments are available. I found that each of Briggs & Riley’s luggage collections featured something for everyone. From added packing spaces to additional safety features they have successfully created a range to suit the needs of each and every individual. 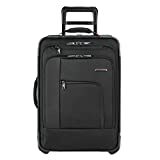 If you are looking to purchase luggage for your travels – which will last a lifetime with added technology for an even greater packing and travel experience I can recommend Briggs & Riley’s collection of travel luggage. Especially if you are in need of extra space this holiday season, being a heavy packer like myself.